Heraclitus like a lot of wise people had an understanding of the nature of things that was very much in tune with astrology. He was born about 2500 years ago so unfortunately we have no birth data but Capricorn Research would be prepared to bet on Pisces being strong and that he would have a number of oppositions in his own chart. But why start an article about someone as irritating as TV personality and sometime Conservative politician, Gyles Brandreth with an introduction about the wisdom of Heraclitus ? As a host on morning TV he charmed the audience with fancy, sometimes bizarre sweaters sent in by viewers. He made good use of his intelligence on such shows as ” Countdown ” where he appeared over 300 times in Dictionary Corner, more than any other guest. He seems to be constantly on ” Have I Got News For You ” and the radio show ” Just a Minute ” and his face and voice are distinctly recognisable. As well as all this he is a former European Monopoly champion, and President of the Association of British Scrabble Players. He is an after-dinner speaker, and he held the world records for the longest continuous after-dinner speech, at 12 and a half hours and for the longest ever screen kiss. He also has business and political interests and became a Conservative MP. He was interested in a career in politics but was side-tracked by his success as a TV celebrity. Brandreth has led a double-life for many years as a flamboyant court-jester and as a serious intellectual and rather than make a choice between the meaningful stuff and the utterly superficial he has chosen to live both ends of the spectrum at the same time. And he is a Sun Pisces with a lot of oppositions. The Zodiac cycle is a circular form of progression from the simplest form of expression of the self in Aries to the most complex in Pisces. Pisceans are the signs that are most difficult for an astrologer to delineate because they contain aspects of all the previous signs. They have a sensitivity and a capacity to absorb atmospheres and experiences like a sponge. As a sign they have very little sense of a consistent self. Every time a Piscean wakes up in the morning it is a different experience, a bit like trying to step in Heraclitus’ river. 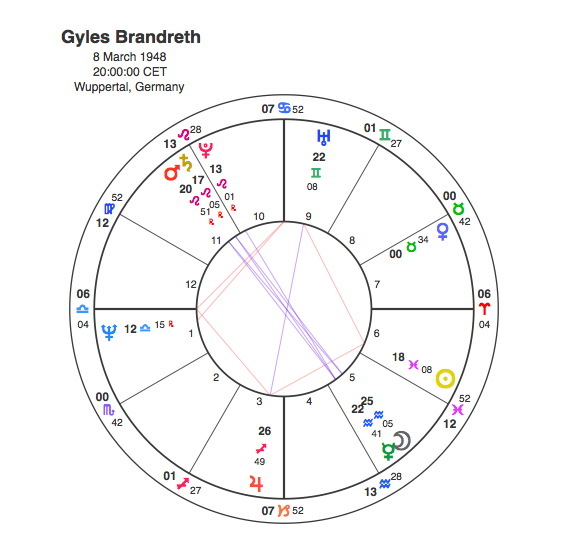 In many ways Gyles Brandreth is a double Pisces because he has the sign’s ruling planet Neptune conjunct his Libra Ascendant. So there is a sense of all things being possible. One aspect of a Libra Ascendant is that all the houses and signs are opposites. Libra the 7th sign is in the 1st house and Aries the first sign is in the 7th. This interesting mix has a big part to play in Brandreth’s chart. His Sun is the apex of a T Square from an opposition between Jupiter in Sagittarius in the 3rd and Uranus in Gemini in the 9th house. Both houses and signs are to do with mentality, Gemini and the 3rd covers the processing and communication of information and sits at the superficial end, Sagittarius and the 9th rules higher education, intellectuality and the understanding of concepts. Jupiter in Sagittarius in the 3rd would create an expansive and extroverted communication of things that might appear to be trivial. Uranus in Gemini in the 9th house would suggest an unconventional approach to the higher philosophical questions and a strong desire to communicate this view. So Brandreth feels a strong pull between the banal and the profound and this opposition focuses onto the Pisces Sun. Anyone with the Sun as an apex planet is someone who feels a strong drive to project themselves so this is why Brandreth seems to be constantly appearing on any programme to do with the brain. Another very important opposition in his chart is between the Moon and Mercury in the 11th sign Aquarius in the 5th house and Mars and Saturn in the 5th sign Leo in the 11th house. Aquarius and the 11th house rule politics and the coming together of people to form groups of like minded individuals. Leo and the 5th house is much more to do with the interests and performance of the individual. Aquarius and the 11th aim for equality, Leo and the 5th indulge in the expression of ego. The Moon and Mercury in Aquarius in the 5th house indicate liberal and unconventional views that have to be expressed as a performance. Mars and Saturn in Leo in the 11th house point to a dynamic but essentially conventional and conservatively self centred approach to politics. This two way pull shows Brandreth to be both radical and utterly conventional at the same time. The 5th house rules dramatic performance and the 11th rules the media so its not surprising that he’s barely ever off our screens. Brandreth must have had more guest appearances on other people’s shows than anyone else in history. Gyles Brandreth married in 1973 as Pluto was conjunct his Libra Ascendant but the time in his life when he felt most pulled by these opposite planets was in 1992 when he became a Conservative MP. Pluto created a T Square from 1992 – 3 in square to his Moon / Mercury and to his Mars. Brandreth’s strong political ambitions ( Mars in Leo in the 11th house ) were always likely to be thwarted however due to Mars conjunction with the restrictive Saturn. Its also true that all the other pulls in his chart were just too strong for him to concentrate on a political career and so his life at Westminster only lasted one term until 1997. The great thing about astrology is that it brings understanding and acceptance of people’s differences. Gyles Brandreth has to contain and express all these different and even opposite parts of his person and Capricorn Research will try hard not to be annoyed by his constant presence in the media in future.